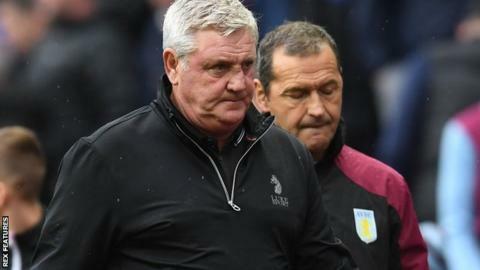 Steve Bruce says he is "never going to walk away" as Aston Villa manager despite seeing his side booed off the pitch after losing at home to Sheffield Wednesday. The Owls consigned Villa to their first home defeat of the season in Bruce's 100th game in charge of the club. After Villa dropped to 13th in the Championship table, Bruce acknowledged the supporters' discontent at the final whistle. Bruce told BBC WM 95.6: "I can understand people's frustrations and disappointments but that's only the fifth time in my two years that we've been beaten here. "It's difficult at the moment. No matter what I do, in some people's eyes I'm not going to be the right fit. "There's nothing I can do about that. I will stay on the ropes and stay with it. That will never change with me. I'm never going to walk away from a challenge - and it's certainly been a challenge. "In some people's eyes, I will never be the answer. That's obvious, but the one thing that changes it is results, so we need a few results. I do believe we've got the nucleus of a very decent team again, given time." Villa, who have now won just three of their opening nine Championship games, allowing Wednesday - who won 2-1 at Villa Park for the second season in succession - moved above them to 10th. After a slow start to the season, Wednesday, who host league leaders Leeds on Friday, have taken 13 points from their past six games. Match ends, Aston Villa 1, Sheffield Wednesday 2. Second Half ends, Aston Villa 1, Sheffield Wednesday 2. Delay in match Daniel Pudil (Sheffield Wednesday) because of an injury. Offside, Aston Villa. John McGinn tries a through ball, but Yannick Bolasie is caught offside. Attempt blocked. Lucas João (Sheffield Wednesday) right footed shot from the centre of the box is blocked. Assisted by Adam Reach. Attempt blocked. Jack Grealish (Aston Villa) header from the centre of the box is blocked. Assisted by Ahmed El Mohamady with a cross. Attempt missed. Conor Hourihane (Aston Villa) left footed shot from the centre of the box is high and wide to the right. Assisted by Yannick Bolasie. Substitution, Aston Villa. Anwar El Ghazi replaces Jonathan Kodjia. Offside, Aston Villa. Yannick Bolasie tries a through ball, but Tammy Abraham is caught offside. Attempt missed. Yannick Bolasie (Aston Villa) right footed shot from outside the box misses to the left. Attempt blocked. Jack Grealish (Aston Villa) right footed shot from the centre of the box is blocked. Assisted by Jonathan Kodjia. Substitution, Aston Villa. Yannick Bolasie replaces Albert Adomah. Goal! Aston Villa 1, Sheffield Wednesday 2. Steven Fletcher (Sheffield Wednesday) header from the centre of the box to the bottom left corner. Assisted by Joey Pelupessy with a cross following a corner. Corner, Sheffield Wednesday. Conceded by Alan Hutton. Attempt blocked. Steven Fletcher (Sheffield Wednesday) left footed shot from the centre of the box is blocked. Corner, Aston Villa. Conceded by Daniel Pudil. Attempt missed. Steven Fletcher (Sheffield Wednesday) header from the centre of the box misses to the left. Assisted by Adam Reach with a cross. Attempt saved. Marco Matias (Sheffield Wednesday) left footed shot from the left side of the box is saved in the centre of the goal. Assisted by Adam Reach with a through ball. Attempt saved. Steven Fletcher (Sheffield Wednesday) left footed shot from outside the box is saved in the bottom left corner. Assisted by Adam Reach with a through ball. Attempt saved. Albert Adomah (Aston Villa) right footed shot from very close range is saved in the centre of the goal. Assisted by Conor Hourihane with a headed pass.